Once you’ve started to place clips in your Media 100 timeline, you’re going to want to start to do some basic shot manipulation, like adjusting crop, scale, position, etc. The Motion Editor is the place you’re going to go to do this type of basic effect work. The first thing we need to do, is to choose the clip we want to manipulate. 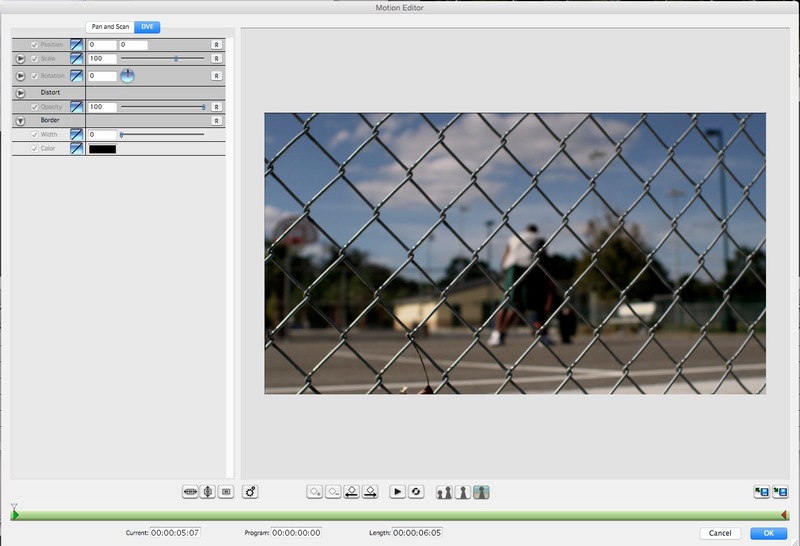 To access the Motion Editor in Media 100, simply right click on your clip, and select it from the menu. Or you can always use the shortcut SHFT+CMD+O to quickly get access to it. You’ll notice at the top of the Motion Editor in Media 100 that you can choose from Pan & Scan, or DVE. Let’s start out by selecting the DVE tab. Once in this tab, we will now have the ability to manipulate up to six clip-based parameters including Position, Scale, Rotation, Distort, Opacity and Border. You’ll notice that by either simply grabbing the slider beside the parameter you want to adjust, or by grabbing the bounding box around the clip and dragging it (you will need to turn on the on-screen controls in the bottom toolbar of the DVE window), you can adjust the appropriate parameter to your liking. Please keep in mind that this technique is designed for static elements that won’t be keyframed. We’ll get more into keyframing in an upcoming Media 100 lesson! Click here to learn more about Media 100, and it’s now free!! Check back soon for more Media 100 tutorials!